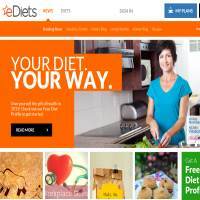 eDiets.com has undergone some massive changes in recent times. It now offers a variety of diet plans which are interchangeable whenever you feel like a switch. It also hosts a bounty of online recipes and a handful of tracking tools to help you manage your weight. This site once provided pre-made meals, direct to your door, providing food to control your calorie intake and help you lose weight. Unfortunately, they seem to have received a number of complaints regarding the quality of the meals and their freshness, and this model has now been abandoned. Instead, the site provides recipes and tools to help you take control of your diet. The tools available from Ediets are useful, albeit a little bit basic. You can calculate your BMI, choose a plan (based on your answers to some questions), add recipes to a calendar and then print out shopping lists. The data stored on foods is pretty good and should cover most of the brands available, and you can also edit the quantities you’re eating to see the effects in terms of your nutritional intake. In terms of exercise, there’s not much on offer here except for a tool to record your workouts. If you need advice or support exercising, you’ll have to go elsewhere. Videos are limited to explaining how the system works, and generally the site feels a bit bland or underdeveloped. At around $10 per month, eDiets isn’t expensive. However, we feel that they don’t really offer a great deal of tools (and none of those they do provide are particularly innovative) for the money. You can read blog posts and a few additional articles, but this information is also somewhat lacking in comparison with its peers. In fact, if you go to the FAQ you’ll notice that it’s very sparse, and our searches for information offered no viable results. There are currently no community features on eDiets.com, although the FAQ suggests these might be coming in the future. As it stands, this website feels like it’s in its infancy. Perhaps abandoning their old system is still requiring them to work out their niggles and they haven’t quite got around to providing all the information we’ve come to expect from a weight loss website such as this. In short: e-diets isn’t a bad site, but it’s not particularly outstanding in any area, either. Whilst it’s not expensive, you can still find better value for money. At least they’ve done away with their (supposedly) dodgy meal deliveries.